The thrilling sequel to With This Curse, winner of the 2015 Daphne du Maurier Award for historical mystery/suspense! She went in search of her past...and found danger in the present. Accompanied by her devoted husband, Atticus, Clara arrives at Thurnley to find intrigue brewing. Her boorish uncle, Horace Burleigh, is greedy for her wealth and desperate to protect the family's mysteries. Superstitious fear of Atticus torments the hulking Romanian servant, Grigore, and even the soft-spoken young ward, Victor Lynch, may have secret motives for getting close to Clara and her husband. When her grandmother dies under suspicious circumstances, Clara feels compelled to investigate. And when Atticus vanishes mysteriously, she must draw on all her strength and determination to find him before his time runs out...before her life can be cursed once more. This is a gothic romance from Amanda DeWees. It’s the second of her books that I read but I spent some time reading some classic gothic romance and I have to say I like her style. There are some gothic elements but it’s not completely out and out gothic with twists that are there just to create sensation, especially in this one. She deals more with superstitions and how people deal with their prejudices rather than monsters or supernatural creatures. I enjoyed this book more than the first one of the series. It seems the story just grew bigger and all the aspects of the atmosphere and the characters that appeared in the first book just came more alive in this one. The main characters, Clara and Atticus, are good characters and together they are a great couple. The book picks up almost exactly from where the last one left and we could go one with the rather recently married couple in a voyage through a gothic England and some Eastern European folklore that create a good atmosphere for the mystery and the romance (and the romance was even better than in the beginning, since there was more understanding between the characters). We have some twists and turns for the mystery that are entertainment enough to make this a good and light book. I was given a copy of the audio book to review and I would really recommend it to fans of this style (even if you are not completely a fan of the gothic style, this one is a light one so if you like mystery and romance, I would still recommend it). The narration is outstanding with an excellent range of voice and tone, improving the listener experience. It’s a first person narration, and Elizabeth Klett as Clara is a perfect match. I enjoyed this sequel as much as the first. Family secrets, another spooky house, monsters and folklore - DeWees creates an eerie Gothic atmosphere perfect for a dark and stormy afternoon. The twists and surprises kept me guessing until the end. Elizabeth Klett does another great job of narrating. Each character has his or her distinct voice making it a pleasurable listen. Gothic historical romance at its finest! 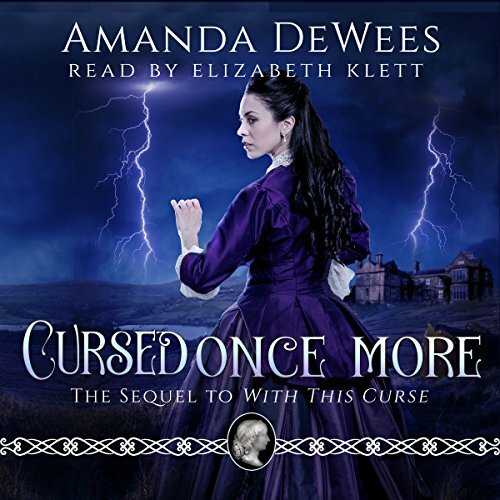 Cursed Once More is another thoroughly enjoyable Gothic historical romance written by Amanda DeWees. Picking up after the events that transpired in With This Curse, Clara and Atticus are enjoying being newlyweds when Clara receives a letter from her grandmother whom she's never met. With hopes of learning more about her mother, as well as her father who died soon after she was born, the pair head off to meet the estranged family. Soon after they arrive, the couple are faced with murder, imprisonment, and kidnapping. Like in With This Curse, the story flows naturally, the plot is suspenseful, and the setting is haunted. There are several bad guys in this story, instead of only one, and there are several family secrets and superstitions that are entertaining and leave you guessing. Atticus and Clara are truly heroic and their love for each other is undeniable. Elizabeth Klett’s narration is fantastic. She really brings Atticus and Clara to life, as well as the secondary characters, giving each one their own distinct voice. Her intonation and pace is simply sublime. In summary, I can't wait for the next book written by Amanda and narrated by Elizabeth! What made the experience of listening to Cursed Once More the most enjoyable? Not only was the story very well written it was excellently narrated as well. The characters came to life and the foreboding atmosphere really shone through. The plot did keep me guessing and entertained all the way through. The mystery of Clara's background and the secrets her uncle wants to prevent her from finding out make for interesting reading. The creepiness of the crumbling old mansion and the strangeness of her new found family really add to the moody atmosphere. I have listened to Elizabeth Klett's narration of 'With This Curse,' the book preceding this one and I enjoyed both books immensely. I would certainly listen to both of them again. Klett does a fabulous job with the material and I now look for her name when considering buying an audiobook. Yes, because it's really interesting. What was one of the most memorable moments of Cursed Once More? In the very beginning and introduction of Clara, the main character. What about Elizabeth Klett’s performance did you like? Ability to perform an Audio book in a way that's interesting. I enjoyed both With This Curse and this sequel, Cursed Once More. Clara and her husband Atticus are sympathetic characters and the author makes us hope nothing bad happens to them, but you will have to get and listen to this suspenseful story to find out their fates. Elizabeth Klett is my favorite Audible narrator because she has a well-modulated voice that she uses to distinguish the different characters in the story. Her English accent is superb. Amanda DeWees writes well so she and Ms. Klett make this an all-around interesting and enjoyable listening experience. Thank you. What did you love best about Cursed Once More? It picks up where the mystery/thriller "With This Curse" leaves off. Atticus and Clara are happily married following the harrowing events at Gravesend But a mysterious letter from a long-lost relative places Clara in danger again as she unravels family secrets and plunges headfirst into madness, deceit.... and murder.